Christmas is a special time of year at Walt Disney World, but it can also be a very busy time of year. In fact, the week of Christmas can be the busiest of the entire year at Disney World. But if you are looking for that perfect evening at Disney, with the castle lights, fireworks, Christmas parades and special shows without all the crowds, then definitely check out Mickey’s Very Merry Christmas Party! Mickey’s Very Merry Christmas Party is a special event that takes place at the Magic Kingdom theme park. It is held on a number of days in late November through December and happens at night, after the theme park closes to regular day guests. Technically, the event begins at 7 pm, but usually you can begin entering the park around 5pm. Entering the park early is advisable because at 7 pm there will be a mass exodus of day guests. That combined with party guests entering at the same time makes for a real cluster of crowds. ** Make note regular park tickets will NOT work for Mickey’s Very Merry Christmas Party. You must purchase a separate ticket for the event itself. Welcome to the Magic Kingdom – all decked out for the Christmas holiday! The whole point of Mickey’s Very Merry Christmas Party is to create a more enjoyable atmosphere with less crowds, so that you can enjoy everything that this special event has to offer. Therefore, Disney sells only a limited number of tickets per event. This ensures that the crowds are kept at minimum, and helps make the experience that much more enjoyable. The event takes place at 7 pm and goes until midnight. Event though you do not have as many hours in the park, because there are fewer guests, you will have more than enough time to do everything that you want to do. So when you think about it, it may actually be better than spending a full day in the park fighting the holiday crowds! The atmosphere, special parades, and shows are really what make Mickey’s Very Merry Christmas Party so much fun. As soon as you enter the park, you will see special lighting and holiday music that set the tone for the event – putting you in the Christmas spirit right away! There are also special shows all over the park just for the event. We really enjoy the shows that retell childhood stories in a humorous way, such as “Twas the Night Before Christmas” or “Rudolph the Red-Nosed Reindeer” with all the Disney characters participating in different roles. Watching these shows remind me of my favorite childhood Disney cartoons for the holidays! 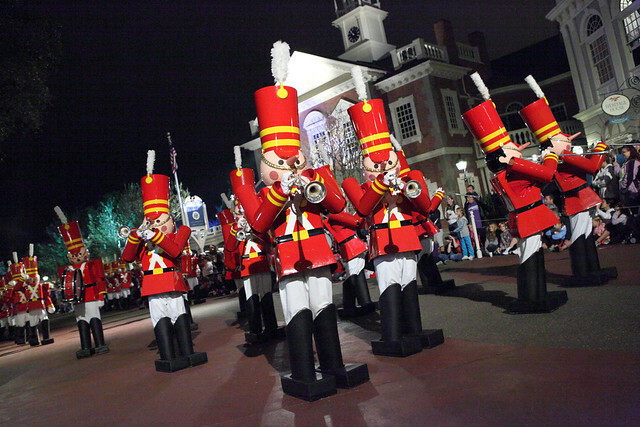 Mickey’s Very Merry Christmas Parade is a special parade that is held during the event as well. Complete with all the characters dressed up in their holiday finest, dancing gingerbread men, and an army of life-size toy soldiers marching in unison makes for a festive experience that brings you back to your childhood. And of course, Santa and Mrs. Claus make an appearance! Reindeer dance in the Disney Christmas parade and bring Santa down Main Street! ** NOTE: During the week of Christmas this special parade is held daily for all day-guests in the park. However, that time is when the parks are at their most crowded. So you can see the same parade during this special event without the crowds. Holiday Fireworks that Will Knock Your Socks Off! During Mickey’s Very Merry Christmas Party, they also have a special fireworks show. This awesome show goes above and beyond the typical fireworks shows that you see above Cinderella’s castle on any given night. Complete with special lighting on the castle, holiday music, and perhaps even Rudolph and Santa flying from the castle, you can’t help but have a huge smile on your face. Plus, the fireworks usually include “perimeters” — meaning that at certain moments during the show, fireworks will literally surround you all around the park! Perfectly synchronized and with each other and the music, it’s hard to describe the feeling while seeing this fireworks show! Fireworks during Mickey’s Very Merry Christmas Party will blow you away and fill you with holiday cheer! Holiday Cookies, Hot Chocolate, and Snow on Main Street! Topping off your experience at Mickey’s Very Merry Christmas Party is the fact that there are “cookie stations” all around the park, offering free holiday cookies and hot chocolate! Included in your admission ticket, we love indulging in these holiday treats, especially while watching the parade and fireworks. While on Main Street USA, you will be overcome with holiday spirit as you enjoy the lights and décor around you, listen to holiday music, and even feel snow falling on you from the sky…yes, snow! Everyone gets to experience what it’s like to have a white Christmas, and your heart will be filled with joy and love – especially when you have your family around you to experience such a wonderful moment. We told dad that if he wore this hat, he could have all the hot chocolate and cookies he wanted at Mickey’s Very Merry Christmas Party. Mickey’s Very Merry Christmas Party is Worth It! I can’t tell you how worth it buying a ticket to Mickey’s Very Merry Christmas Party is. When you think about the price of the party versus a price for an everyday ticket, you are actually getting more for less. There are less crowds and more holiday activities and shows. Not only is the party a lot of fun, but you will get to experience more than just a typical day in the park. Highly recommended! Spending Christmas at Disney World – and sporting my Minnie-ear Santa hat (which Josh is not so much a fan of). ** Are you planning a Disney visit around October? Check out our post on Mickey’s Very Scary Halloween Party too! Similar concept, but different theme and experience.